Following my ordination at Trinity Cathedral, Trenton, I became Rector of St. Stephen�s in Florence, New Jersey. This was a small assisted parish near the steel town of Roebling, bordering on Burlington. The town was the winter headquarters of Hunt Brother�s Circus! The chapel at St. Stephen�s was considered temporary when built in 1859. It was in Florence that I first ministered and gained experience on my own. The salary was $2,000 per year. I never thought much about it. This was an isolated situation where I lived in the pigeon infested old Victorian rectory built in 1883. The chapel is still there. After three lonely years as Rector of St. Stephen�s, I was called to be Rector of Christ Church in Woodbury. I arrived in August 1960 as the eleventh rector and succeeded The Rev. Canon Robert G. W. Williams. Canon Williams� family was warm and gracious. A bond of friendship was formed that still lasts with their daughter and son. 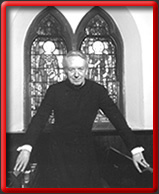 Canon Williams was an excellent priest who served the parish for forty-two years. The property needed major repairs, and there were many new challenges, demands, and a ministry to fulfill. There was no secretary, office equipment, or extensive files, but there was a dedicated group of parishioners because of Canon Williams. Forty- two years must be considered as a remarkable accomplishment of dedication and pastoral concern. Upon arrival a secretary was hired. A temporary office was arranged in the vestibule of the rectory. As the new rector, I worked six years without an assistant while maintaining a full schedule of weekday and three Sunday services, plus handling all pastoral and administrative responsibilities. It was a life, not a job. I was taught that, and I still believe it. I never asked what my salary would be when I was interviewed. A written contract was not even considered. The question for me was, Do they want me there, and do I feel called to go there if they want me? When I moved into the rectory, I followed a rector with a large family. I knew that people might think, Boy oh boy, what is that 27-year-old guy going to do in the big old rectory? That�s a lot of space for one person. It was. I wasn�t much of a cook, so I ate most of my evening meals at the old Homestead Restaurant in Woodbury. The Kurtz family who owned and operated the restaurant were kind to me and became friends. Eventually I brought my parents to live with me. They worried that I would starve! I am thankful to my dear mother for helping to keep a nice home, not only for me, but also for the parish. Needless to say, I eventually filled up that house with all kinds of interesting things from travels here and there. My advice to everyone is NEVER MOVE! Three men were presented for the priesthood, and five priests served as assistants under my tenure. Several served six years, and one for ten years. It is unusual that such Assistant/Rector relationships last that long. A great many seminars and conferences were held at Christ Church. Lecture series brought speakers from the United States and abroad to Christ Church. Attendance at these events brought together people of all faiths. I was fortunate in those days of being instrumental in helping to bring together two early panel discussions at the Roman Catholic Church. This was the first ecumenical effort in the city of Woodbury. I also served as President of the Woodbury Clergy Association. Bi-weekly healing services were a strong aspect of my ministry, and special healing missions were held with guest speakers through the years. Retreats were also held, along with a full complement of Lenten programs. A complete Holy Week services schedule was offered each year during my rectorship, including the Three Hour Good Friday service with emphasis on the Seven Last Words. I enjoyed serving in the early years of my ministry as an instructor at the Diocesan Girls Summer Conference. I also led retreats at the Evergreens Home for the Aged, and have been invited four times to speak at Trinity Cathedral. My varied interests in mystical theology and parapsychology are mentioned in some eighteen books.